Pita Pit Pimp - Lifestyle H4x0r - Uses the word "lackadaisical"
So I’m going to start off by saying I might come off as the opposite as some transformation stories. When people say they were in top shape while back in high school, active and on all the sports teams, I was the opposite. I was overweight, didn’t care for sports, and really wasn’t active unless it was with a Nintendo controller in my hand. Around graduation time, when you wonder the future and what am I going to do for the remainder of my life, it started to set in. Those years are gone and maybe I didn’t spend that as best as I could or should have. So, in college I decide to change my lifestyle, and incorporate fitness and a cleaner diet. By the end of college, I had lost some weight and started to feel much better. Shortly after, I began to have a drive for business, and a desire to succeed. I knew I would have to dress for success to obtain it. 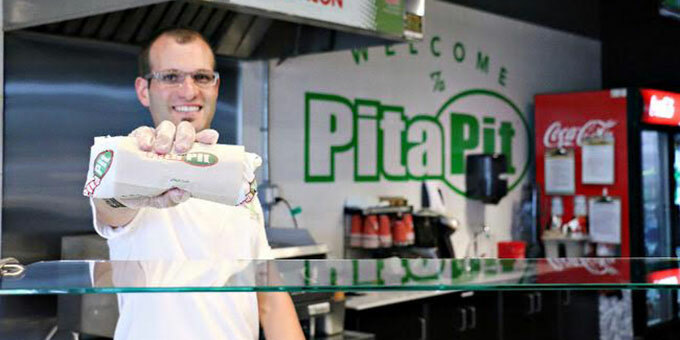 At 22 with the help of my parents I opened my first Pita Pit franchise, and at 24 I had saved the pennies to bring on store #2. When operating the 2 locations. it was then I realised my lifestyle became busy at a young age and I needed to make better use of my time in the gym. That was when I looked into John Savidis. I have been a member for approx 2 years now. I joined up during that last year of when John Savidis was operating out of the Hamilton Mountain spot. I entered a limited time promotion at the time (which was WagJag through the Spectator) to try a month. I wanted to experience a new type of work out and the bootcamp classes were great. The second time the wagjag was offered I decided why not try it once more, as I still wasn’t fully sold on the idea. After the second time around I realised how effective it was of my time and just how much I enjoyed it that it was time to become a member. 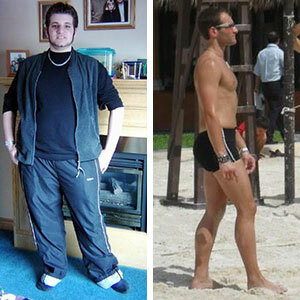 The program has helped me learn some new exercises through the personal trainers and overall helped me keep in shape while juggling the businesses. I want to say I’m happy when I look in the mirror (which sure I am when comparing to my before picture) but with fitness, business, and anything in life there is always room for improvement. I personally have not encountered any health conditions but my family does have a history of heart disease, which is a reason looking back that I was happy I decided to shape up. My family and friends are inspired to see that I was able to lose weight, and keep it off. Some friends will turn to me for advice when working out or enjoy working out with me if we go to the gym together. I think my family was a bit worried when I was younger that my lackadaisical character may affect my future but they are beyond proud that I turned that around. Same may go for some friendships from high school – I was always social so had many circle of friends – but the ones who I run into from not seeing in long period will be shocked to see I’m not the overweight person they remember. When I tell them of the accomplishments I’ve achieved in my life they are further more surprised. Try a complimentary week! Try a promotion when offered. The staff are always offering something great for new people. You will see the difference the facility will offer. Certainly, it’s a great community of members. Everyone is motivated to improve their health and fitness so being surrounded by like minded individuals is awesome! The staff at Lean & Fit are all great! Deb is always out to get me (or push me further) in the cardio kick boxing class. Corey 2.0 asked me one day “hey when are you going to try a training session” I replied let’s do it next week. We’ve been training weekly for a few months now and he helps me improve form and learn new exercises. This past year, I accomplished opening a third franchisee and purchased a rental property. I think my goal was to obtain 3 Pita Pits before 30 and I did that by 27 🙂Naturally, I want to continue to improve and excel in my entrepreneurial endeavours…But for 2017, I want to focus my attention to one of my earliest goals. When I was younger, I was fascinated with firefighters. I’m going to try to apply for the volunteer fire service. It may be a tough go, but I don’t want to look back and regret not trying. The last 5 years have been so busy in dedication to growing the business, so I would really love to be able to give back now through volunteering. And of course stay committed to a lean and fit lifestyle.